Articles and information about emetophobia and the fear of vomiting. If you’re one of the many people suffering in silence with emetophobia or a fear of vomiting, you know the severe impact it can have on virtually all aspects of your life and how difficult it can be to find help. Fortunately, a comprehensive and affordable program specifically designed for emetophobia and developed in conjunction with a Doctor of Clinical Psychology is now available so you don’t need to continue to sacrifice your life for your fear. 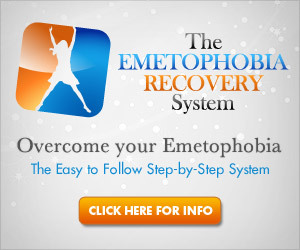 We highly recommend you learn more about the Emetophobia Recovery System below, the original program tailored for emetophobia that has been used successfully by people around the globe who were living with their fear just like you. For people who have Emetophobia, searching for relevant and helpful information can be difficult and frustrating. The disorder is so little studied that even professionals may have trouble treating it. Others are even reluctant to recognize Emetophobia as an anxiety disorder. Read about the important findings Dutch researchers have discovered from studying people with Emetophobia.